Share the post "Timid Tulip"
I’m afraid if it doesn’t stop raining soon, our farmers are going to be in a whole lot of hurt–especially if their farmland is in low-lying areas. There may be many of them having to switch from corn to soybeans since their growing season is shorter. While speaking with a well known today, I mentioned how this year of weather in North Iowa looks to be one that will stick in our memories for years to come. Just yesterday, another senior couple mentioned that they’d never seen a winter like we had–especially in the month of April. Every time I see a pair of geese wandering about Downtown, I feel so sorry for them knowing their hatchlings were lost to those deep April snows. I’m pretty sure it happened with the ducks as well because I’ve seen no ducklings so far, but there may be some hope for them because they usually start nesting after the geese. Today’s public open house at 716 S. Taylor was a great success in spite of the light rain. Everyone in attendance showed great interest, and while I was there, another agent sent me a text message asking to show it on Monday. It’s very hard to find a home under $90K that has as much to offer–especially since it has a double garage. I heard one of the buyers mentioning to another how it would likely not last on the market. One extra you likely not find, is a heavy duty built-in/embedded cylinder safe cleverly camouflaged in it’s basement concrete floor. It only made sense at the time, because the husband of the owner ran a late night eatery, so he likely had to bring cash home every evening and store it in that safe for the night, and then deposit it the next morning after the banks opened. That’s the second built-in safe I’ve encountered in a home in less than a year. With the way our world is becoming, I wouldn’t be surprised if all the more homeowners are having similar ones installed in their dwellings. With the on-going computer hackings by China, Russia, North Korea, and a few others naughty countries, very few know, that’s all it’ll take, is one big concerted fire-storm of hackings by them, and then afterwards, we’d find our banks and infrastructures indefinitely disabled. Don’t you think it’s always best to have the mindset of preparing for the “worst case”, while hoping for the “best case” scenarios. After realizing I had a few hours to spare later this afternoon, I decided to take in an out-of-town church service. I’d visited it before, which gave me an incentive to darken their doors once again. The pastor is young and possesses a vibrant voice which he freely uses to relay his message during his sermons. The last time I was there, I couldn’t help but say to him while walking out, “I wish you were stationed in Mason City so I could hear your words every week.” At the time, I should have informed him that my compliments of others are never loosely given. Before the service ended, he asked all the mothers to stand while reading a very nice piece about the selfless giving nearly all of them had quietly done while rearing their children and caring for their husbands. While I was out checking on a home late this morning, I just happened to notice a single tulip growing in the midst of a patch of day lilies. 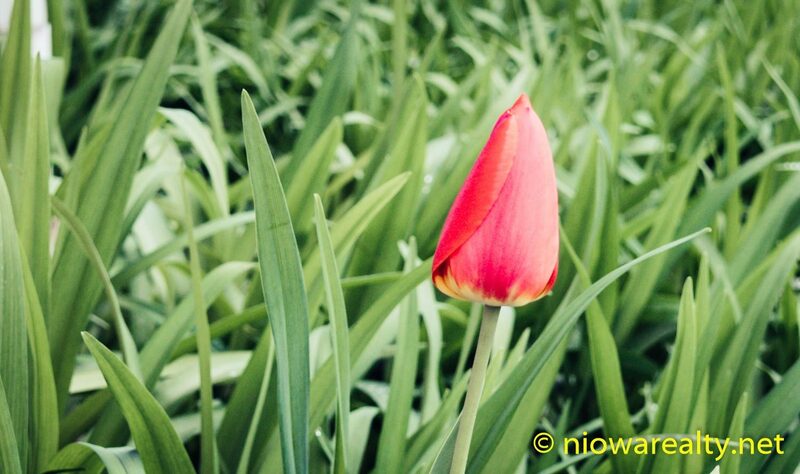 Those vibrant contrasts of green and red, prompted me to go back and get my camera so to take the above photo of that singular timid tulip which appeared determined to not open its flower for everyone to see. Tonight’s one-liner is: Slipping into madness is good for the sake of comparison.